Great Aspirations Scholarship Program, Inc.
Home / Projects / Projects / Great Aspirations Scholarship Program, Inc.
GRASP is non-profit education organization which provides financial aid advisors at no charge to help students obtain the necessary funding to continue their education after high school. GRASP's professional financial aid advisors work in high schools and private settings, without charge to students and families, to assist in overcoming financial and motivational challenges to the goal of higher education. 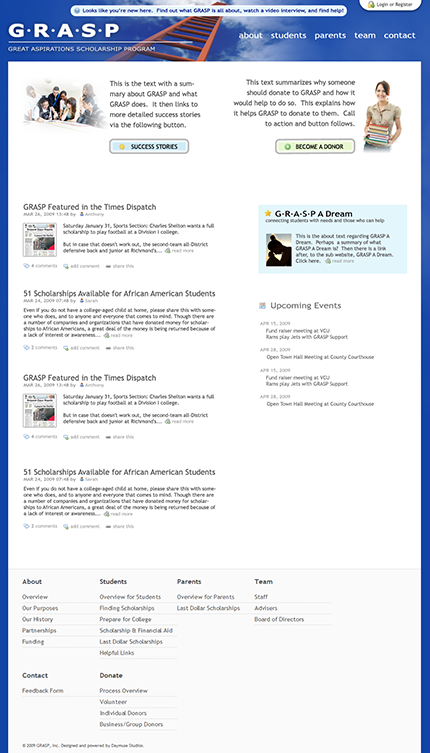 Daymuse created GRASP's initial web presence in 2008. The Great Aspirations Scholarship Program, a non-profit education organization which provides financial aid advisors at no charge to help students obtain the necessary funding to continue their education after high school, was seeking to develop a web presence. The organization, started in 1982, had no current web presence which meant they didn’t know where to start or what they needed. GRASP also needed branding, design, and information architecture expertise as well as hosting which meant this would be an end-to-end project.